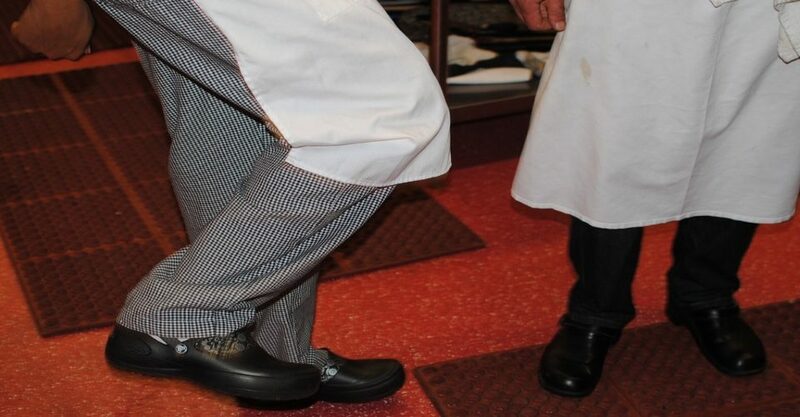 Chef Clogs are Great in the Kitchen - Which Ones Work Best? Some professions spend a lot more time on their feet than others, and if you are a chef or work in a kitchen, odds are you spend the entire day up and moving around. This can be rough on your feet, and having a good pair of shoes is a must if you want to survive in this industry. That’s why chef clogs are catching on in popularity. Chef clogs are pretty simple. They are a clog specially designed for use in the kitchen. Not sure what you’re looking for yet? Our guide will get you started in finding the perfect shoe for the kitchen. Working in a kitchen and around food carries with it a certain set of needs. You need something that has good traction first and foremost. Something that is slip resistant is vital for your safety. You might not think about clogs with their wooden sole as being slip resistant, but many types of clogs, especially those specifically designed for use in the kitchen, have rubber in between the wooden portion and the floor, giving you the traction that you need to stay safe. You will also want something that will keep your feet dry. If one of your co-workers spills something on you, you don’t want to spend the rest of the day with wet feet. That’s an unpleasant feeling, as we can attest to! Be sure to select a clog that is waterproof so you can realize this extra comfort. Other than that, you have a lot of freedom to choose what you want depending on the personality of your kitchen and yourself. Want something conservative and professional looking? There’s a clog for that! Looking for something more colorful and flashy? There’s a clog for that, too! Look around, and you are bound to find the ideal clog for your professional needs.